1977-78 was the last year of a four-year run where O-Pee-Chee made a separate set of players from the World Hockey Association. It wasn't the league's last year, though. It lasted until the next year before many of the teams ran out of money and four of the clubs were allowed to join the NHL. Sensing the coming contraction of the league, 1977-78 O-Pee-Chee WHA Hockey was cut in half to 66 cards. The subsets were among the things to disappear. 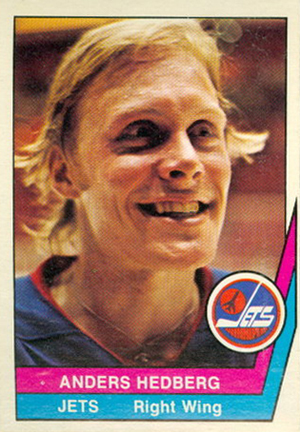 1977-78 O-Pee-Chee WHA Hockey card fronts feature a player photo that is either posed or taken during game play. Two different colored stripes under the picture resemble a hockey stick and include the player's name, team and position. A team logo is placed just above that, partially superimposed over the photo. Backs are vertically oriented and include information inside a series of rectangles. The one at the top has a biography in English. The next one has vital stats and the statistical lines for the previous season and the player's career. A French translation of the biography follows. Finally, a box in the lower left corner has a card number, with a brown stripe extending along then bottom of the card that contains the player's name. The leader cards and All-Star subsets of the previous years are gone from 1977-78 O-Pee-Chee WHA Hockey. However, the one checklist card remained. Card number 1 was the only other deviation from the base set, commemorating the the one-thousandth goal of Gordie Howe's career. For the second year in a row, there are no notable rookies in the set.